Mair Underwood is an anthropologist in the School of Social Science who specialises in bodies. 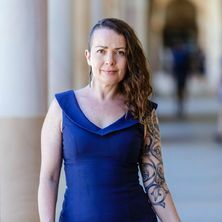 In particular she explores how body modifications (such as tattoo or bodybuilding) are used to create, reflect and disrupt social boundaries such as those of gender and class. She is especially interested in the social lives of image and performance enhancing drugs: how they acquire meaning through social interactions and how they alter social interactions. I am currently conducting participant observation amongst recreational (i.e. non-competitive) bodybuilders. I am interested in how tattoo is used to construct and negotiate social boundaries such as gender and class. I am interested in the social and cultural aspects of human bodies. I am particularly interested in the various ways that people modify their bodies such as tattoo, bodybuilding, cosmetic procedures, weight loss or gain, and genital surgeries. I am currently conducting an online ethnography of recreational bodybuilders. Mair Underwood has written numerous academic publications which have been cited by world experts. She prioritises community engagement featuring in the media regularly, and participating in panel discussions for varied audiences. Mair Underwood has produced 15 papers and two book chapters including two sole aiuthor and 4 first author papers. Fifty per cent of these papers are in ERA ranked A or A* journals and over 50% of these journals have impact factors of 2 or higher. Since her PhD she has presented at three national and two international conferences (one of the latter by invitation to Cambridge with all expenses paid by the conference). Her journal publications have been cited 96 times (Google Scholar) with an average of 6.8 citations per paper. Despite her short research career her h-index is 5 (Google Scholar). Her recognition as a body expert by the community has led to dozens of print, radio and television features, as well as invites to speak to various audiences outside of academia. Underwood, Mair (2018). "SLIN IS THE SAFEST AND MOST ANABOLIC HORMONE": EXPLORING BODYBUILDERS' USE OF INSULIN AS A PERFORMANCE AND IMAGE ENHANCING DRUG. In: , , (S70-S70). .
Underwood, Mair (2015). Some thoughts on tattoo and art. In A permanent mark: the impact of tattoo culture on contemporary art (pp. 22-31) Townsville, QLD, Australia: Gallery Services, Townsville City Council. Underwood, Mair (2017). 'BRO SCIENCE' AND MAINSTREAM SCIENCE: HOW BODYBUILDERS NEGOTIATE KNOWLEDGE AND POWER IN THEIR PERFORMANCE AND IMAGE ENHANCING DRUG HARM MINIMISATION EFFORTS. In: , , (69-69). .
Underwood, Mair. (2006). Living in bodies, living as bodies : the relationship between body and self at different ages PhD Thesis, School of Social Science, The University of Queensland.